Neuroacanthocytosis (NA) syndromes are heterogeneous genetic disorders leading to progressive neurodegeneration of the basal ganglia. The core NA syndromes include autosomal recessive chorea-acanthocytosis and X-linked McLeod syndrome. These disorders have Huntington disease-like phenotype of choreiform movement disorders, psychiatric manifestations and cognitive decline. They may have additional features including myopathy and axonal neuropathy. Patients with McLeod syndrome may develop cardiomyopathy. Self-mutilation of the lips and tongue and a typical feeding dyskinesia are characteristic features of choreoacanthocytosis. We report a patient who had a disabling feeding dyskinesia, leading to a near-starvation status and a significant weight loss. A 32-year old male patient had generalized weakness and documented weight loss of 12 kg developed over an year's time. Medical records revealed that he had a body weight of 60 kg one year back, which had now reduced to 48 kg. For about 2 years, an abnormal involuntary movement of the tongue had caused progressive feeding difficulty. After taking food in the mouth, he could not manage the food bolus. He, therefore, had difficulty in swallowing food and it spilled from his mouth [Video 1]. He neither had sticky or compressive sensation in his throat or in the retrosternal region, nor did he have any nasal regurgitation or cough during the swallowing phase. He had dysphagia equally to both solids and liquids. He was making involuntary suppressible sounds (grunts) and movements (pouting, protruding tongue and blinking eyes) intermittently [Video 1] and [Video 2]. These were simple vocal and motor tics. He had also developed slowly progressive dysarthria of an year's duration without having any language problems. There were two attacks of generalized tonic-clonic seizures for which carbamazepine was being administered. Habits of self-mutilation or psychotic symptoms were absent. There was no history suggestive of visual, sensory, cerebellar or autonomic disturbances. There was mild proximal weakness in the lower limbs. Chorea was prominent involving the neck, trunk and limbs. He walked with a bizarre gait. His five-year younger brother had also developed choreiform movements for about 2 years. There was no history of jaundice, long continued fever, myalgia, photosensitive rash, recurrent head injury or alcoholism. On examination, all tendon jerks were diminished with mild hypotonia in the lower limbs. High arched feet were noted in both the siblings [Figure 1]; however, its significance is not known. On this background of epilepsy, he also had lingual dyskinesia leading to feeding problems, dysarthria, tics, chorea, lower limb proximal weakness superadded to his generalized weakness and hyporeflexia, with a family history of movement disorders. We felt the necessity to rule out Wilson's disease, neurodegeneration with brain iron accumulation (NBIA), Huntington's disease, neurological manifestations of systemic lupus erythematosus (neuro-lupus) and neuroacanthocytosis. An absence of eye movement abnormality and normal higher mental functions ruled out Huntington's disease. Wilson's disease was excluded by the absence of Kayser-Fleischer (KF) ring, the presence of normal serum ceruloplasmin, and a normal 24-hour urine copper estimation. Magetic resonance imaging (MRI) of the brain revealed mild bilateral caudate atrophy but with no evidence to suggest the presence of NBIA [Figure 2]. Complete blood count, kidney and liver function tests, serum electrolytes, lipid profile, test for human immunodeficiency based on enzyme linked immunosorbent assay, blood venereal disease laboratory test, and serum angiotensin converting enzyme levels were within normal limits. Extractable nuclear antigens (ENA) were negative. Creatinine phosphokinase was raised to 1867 U/L. 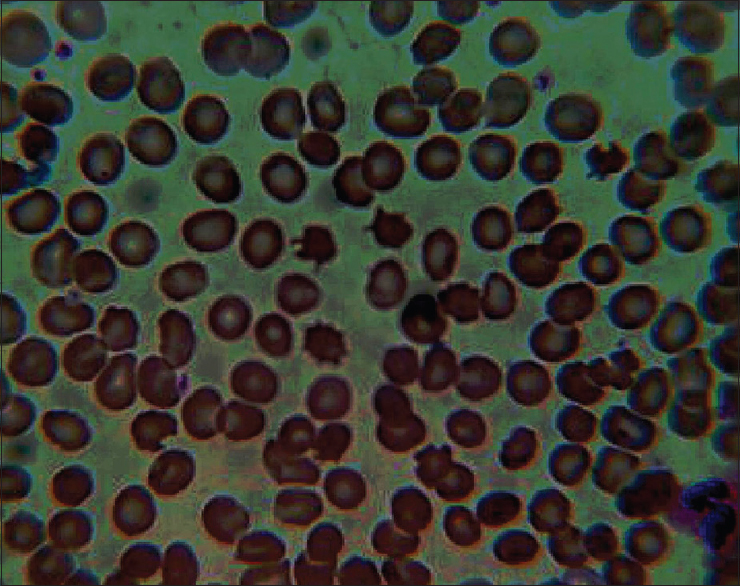 Peripheral blood acanthocytes were visible on screening of three consecutive samples [Figure 3]. Nerve conduction studies showed a sensorimotor axonal neuropathy. Electromyographic study showed myopathic changes in proximal muscles. His electrocardiogram was normal and echocardiography did not reveal any cardiomyopathy. Kell blood group antigen was normally expressed, which made the possibility of McLeod syndrome remote. His deoxyribonucleic acid (DNA) was screened for all 73 exons of chorea-acanthocytosis (ChAc) vacuolar protein sorting-associated protein 13 (VPS13A) to assess for mutations by denaturing with high performance liquid chromatography followed by direct sequencing. The patient was found to be homozygous for a frameshift mutation in exon 33 (c3556-3557 dup Ac). Although his younger brother had developed choreiform movements, he declined to undergo genetic testing. A diagnosis of chorea-acanthocytosis with feeding dyskinesia was made, which had led to his severe weight loss. We initially gave our patient clonazepam, and later on, added tetrabenazine. This improved his feeding and choreiform movements. We inserted a nasogastric tube at the beginning of treatment and removed it later as he improved. We also took the help of therapists to help him swallow his food, and of nutritionists to improve in his feeding as well as nutrition. He has regained 6 kg weight in last eight months of treatment and is on a regular follow-up. The Greek word 'akanthos' means a “thorn”. The term “neuroacanthocytosis” is used to refer to neurological disorders that are accompanied by the presence of thorny red blood cells, that is, acanthocytes. This term can refer to the degeneration of the basal ganglia leading to movement disorders; and, to conditions in which inherited abnormalities of serum lipoproteins result in vitamin E malabsorption, leading to spinal cord and peripheral nerve disorders. Subjects suffering from the latter conditions do not have movement disorders. There are four core neuroacanthocytosis syndromes; two prototypic disorders are chorea-acanthocytosis (ChAc) and McLeod syndrome; and, the other two are pantothenate kinase-associated neurodegeneration (PKAN), a NBIA disorder, and Huntington's disease-like 2 (HDL2) where acanthocytosis is seen in only about 10% of cases. Acanthocytosis is infrequently seen in mitochondrial diseases (mitochondrial encephalomyopathy, lactic acidosis, and stroke-like episodes; MELAS), in some metabolic disorders like anorexia nervosa or hypothyroidism, in cancers, sarcoma, hepatic encephalopathy, psoriasis, Eales' disease and following a splenectomy., All these conditions may be complicated by movement disorders. The association of acanthocytosis and neurodegeneration of the basal ganglia suggests a common pathogenic pathway, which can easily be explored by studying red blood cells (RBCs) harvested from patients suffering from NA. The RBCs from patients with NA show changes in the structure and function of band 3, a key integral protein of the red cell membrane, as well as abnormalities in a band 3 regulating signalling network. However, the relation between the disease-causing mutations, the abnormal red cell shape, the structural - molecular changes and their effects on the function of the acanthocytic red cells remains unknown. Determination of acanthocytosis in peripheral blood smears may be negative in a standard setting and a negative screen does not exclude NA. A more sensitive and specific method uses a 1:1 dilution of blood with physiological saline and phase contrast microscopy. Normally, acanthocytes are absent in peripheral blood. A cut off value of more than 3% to denote pathological conditions is kept, to avoid false positive results from experimental artefacts or echinocytes. Sometimes, the search for acanthocytes needs to be continued because they can appear during the late stage of the disease. The percentage of acanthocytes is not used as a diagnostic criterion for NA, as it is highly variable and does not correlate with the severity of the disease. The mechanism of acanthocyte formation in chorea-acanthocytosis is unknown. Studies of the lipid components of erythrocytic membranes in Japanese patients showed a decrease in linoleic acid and stearic acid, and an increase in palmitic acid and docosahexaenoic acid. Probably these fatty acid alterations modulate the membrane proteins and modify the shape of erythrocytes. Erythrocytes from patients suffering from chorea-acanthocytosis exhibit immunological changes indicative of cellular aging; and, some of their membrane proteins, such as band 3 and 2.1 (ankyrin) self-digest faster than normal proteins do. Band 3 protein in the mammalian brain has a role in anion transport, and hence, its abnormalities may have a role in the pathogenesis of chorea-acanthocytosis. ChAc syndrome typically presents in the early adulthood with a characteristic chorea and orolingual dystonia. Tongue-protrusion dystonia with eating is very suggestive of the presence of this disorder, although it may occasionally be seen in tardive dyskinesia, McLeod syndrome, and PKAN. However, the self-mutilation, with tongue and lip biting often seen in ChAc, is not reported in these other disorders. Patients often use some trick, such as a stick in the mouth, to reduce biting and tooth-grinding. This manoeuvre acts by either a mechanical restraint or a sensory trick (in the case of dystonia). Some patients will hold a piece of cloth in the mouth which also helps to absorb excessive saliva. An alarming trick is to extend the head and to push or throw the food into the back of throat. This trick, as may be expected, significantly increases the risk of aspiration. Severe neck ('head drops') and truncal flexion can occur. Head-drops have been reported also in McLeod syndrome and Huntington's disease (HD). The speed of these movements suggests they are choreic in nature, rather than due to sudden loss in tone (negative myoclonus), or due to the presence of dystonia or neck extensor muscle weakness. Neuropsychiatric symptoms are prominent and may appear before the movement disorder. Seizures are seen in approximately 40% of patients. Neuromuscular involvement includes myopathy and axonal sensory-motor neuropathy. Hepatosplenomegaly and cardiac involvement are seen in McLeod syndrome. There is no curative treatment. The management remains mainly symptomatic. The incapacitating movements can be controlled with typical antipsychotics and dopamine depletors like tetrabenezine. It is, however, a progressive disease and long-term outcome is poor. Neurorehabilitation and behavioural therapy plays an important role. Maintenance of proper nutrition in the ChAc syndrome is a challenge due to the presence of feeding dyskinesia. A feeding tube insertion or gastrotomy may be needed in the later stages of the disease to assist in feeding and to prevent aspiration. Botulinum toxin may also be helpful in reducing such dyskinesias. In conclusion, feeding dystonia in chorea-neuroacanthocytosis can lead to severe weight loss and malnutrition, and is a major concern in these patients. Jung HH, Danek A, Walker RH. Neuroacanthocytosis syndromes. Orphanet J Rare Dis 2011;6:68. De Yebenes JG, Brin MF, Mena MA, De Felipe C, del Rio RM, Bazan E, et al. Neurochemical findings in neuroacanthocytosis. Mov Disord 1988;3:300-12. Cluitmans JCA, Tomelleri C, Yapici Z, Dinkla S, Bovee-Geurts P, Chokkalingam V, et al. Abnormal red cell structure and function in neuroacanthocytosis. PLoS One 2015;10:e0125580. Zhang LH, Wang SP, Lin JW. Clinical and molecular research of neuroacanthocytosis. Neural Regen Res 2013;8:833-42. Pandey S, Soni G, Sarma N. Sensory tricks in primary blepharospasm and idiopathic cervical dystonia. Neurol India 2017;65:532-6. Kushwaha S, Panda A, Mehta V, Malik S, Pant I. Feeding dystonia: A classical presentation of neuroacanthocytosis. International Journal of Case Reports and Images 2013;4:37-40. Harirchian MH, Maghbooli M, Shirani A. A case of choreoacanthocytosis with marked weight loss: Impact of orolingual dyskinesia. Neurol India 2006;54:296-7.